With thanks to Dr Fiona Pender from Cheshire and Wirral Partnership Foundation Trust who describes the Next Step cards which help children and young people identify and talk about their goals in sessions with their clinicians. What was the problem Next Step cards were developed to tackle? Originally, the problem we were trying to tackle was how we could better support our staff to help young people and families set goals when they come to CAMHS. Back in 2010 as a Trust-wide CAMH service, we were looking at how we could have a single outcome measure to evaluate our work. CYP IAPT wasn’t around then, and of course we had the Strengths and Difficulties Questionnaire (SDQ) and the HONOSCA, but a culture had developed in which they were not being used. As a team we decided that Goal Based Outcomes (GBO) were the most useful, and as a result we organised a small project to train people and test it out. We chose four teams across different tiers and age groups and delivered training in using GBOs. Once staff were trained, they started to implement it within their teams and with the young people they were working with. We gathered feedback from clinicians and young people of what they thought of the measure. We found that young people and clinicians really liked the outcome measure, and young people enjoyed being asked what their goal was. However, we also found that often the young person didn’t know what their goal was and when this happened, it was difficult for both the clinician and the young person to move the conversation forward. The research findings were published in the ‘Faculty of Children and Young People’ journal. What are Next Step cards? Next Step is a card based resource that is designed for practitioners to use when talking to young people. There are fifty-two cards in the Next Steps pack, just like an ordinary deck of cards. The cards are not a self-help tool and they are not a treatment; they are a communication tool. The first element of Next Steps is a ‘Life card’ section. There are twelve life cards that are used alongside traffic light cards, and these act as an ice breaker and allows the young person to show visually where they are at. You don’t need eye contact or words but you can quickly establish what a young person is feeling about their current situation, for example they might put their ‘Home’ card in the red. When young people are sorting the cards it can trigger important conversations that otherwise might not happen. After this initial section, the cards move on to help a young person identify a goal and what they would like to be different. Because they are in charge – they enable a young person to take a solution focused approach. This helps to empower that individual to think about what would really help them. We have numbered cards on a scale of 1-10 which are used to set goals. There is Next Steps online training available, although we feel it would be best to deliver the training in person so face-to-face training is being developed, potentially over two days. The training is aimed at community staff who don’t necessarily have specific therapeutic training, so the first day would involve training around how to engage young people, listening work and orientating staff about how to have helpful conversations with young people about their emotional wellbeing. A training will be ready soon, and we have developed a Training-the-Trainer model. Therefore, if the commissioners buy the training in – we can train CAMHS staff to deliver training to their local community staff. It brings a lot of added value. How were the Next Step cards developed? We still had some money left to evaluate the outcome measure project, and some money that was intended to go towards developing a resource for when young people were admitted to hospital. We were, and continue to be, committed to helping young people set goals, and as part of our pilot work the assistant psychologist working with me had printed off pictures of ladders and trees to be used as visual goal setting aids during these initial conversations. We suddenly realised there was something about the visual aspect of goal setting that could be very helpful when those conversations get ‘stuck’. So, we worked with a graphics facilitation company who gave us their input around developing a set of cards specifically to enable goal setting. Card based interventions were already being used in drug and alcohol services very effectively. The cards were designed by both staff and young people in CAMHS in 2011, and try to demonstrate practically how young people would like us to talk about their problems. We had a staff, young person’s and parent focus group working alongside a graphic facilitation company. Although staff helped to co-produce the idea, the wording and the appearance of the cards were driven by the young people and carers. Now that we’ve managed to secure some funding through selling the cards to commissioners, I’m able to actually dedicate some time to it. From September 1st 2016 I’m going to be working two days a week for six months on developing the Next Steps cards and really trying to realise its potential. We’re also developing an app that works almost in exactly the same way as the cards do. Honestly, innovation within the NHS is difficult! I am not saying that we were unsupported, however there was definitely the sense of having to scrabble around for the time and the money! This was despite knowing that young people had told us something important, we had the evidence and we wanted to act on it. I don’t think Trusts are particularly well set up to develop products, it is hard to get extra time or business support. There wasn’t any operational leadership overseeing the design of the Next Step cards, it’s been myself and another few invested colleagues forging ahead over the years. I’ve been the clinical director as well as the lead for Next Steps and have therefore been able to have a degree of influence on some of those conversations to bring Next Steps into the planning for re-integration. The operational support came in the form of people being very happy for Next Steps cards to be used. We’ve only recently got funding to operationally take this to the next stage. How do Next Step cards fit in with your i-THRIVE plans? We’re not one of the early accelerator sites for i-THRIVE, but we are a part of the i-THRIVE Community of Practice. We had heard about the THRIVE framework (Wolpert et al., 2016) and could see it was coming on the Future in Mind agenda, so we used the restructuring of the service as an opportunity to try and think differently about the CAMH service as a whole. Promoting better mental health is everybody’s business, not just CAMHS, and we wanted to help identify what really works when it comes to young people getting help. 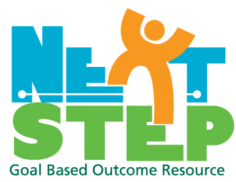 Next Steps facilitates the goals and needs-based approach to care that is key in THRIVE. Within Wirral CAMHS, Next Steps is used for a young person’s choice appointments. The cards particularly address the Getting Advice and Getting Help THRIVE needs groups, although interestingly we have had very positive feedback from Tier 4 services so they could also be potentially useful for the ‘Getting More Help’ and ‘Risk Support’ groups as well. When a young person is under section in hospital no one would typically ask them what their goals are – so the potential to use Next Steps as a way of developing that therapeutic relationship at every stage is huge. We hope that with Next Steps young people can better articulate some of the subtleties of their needs. I think our perception of risk in an in-patient environment means some of these subtleties can get lost. Working in a THRIVE-like way means the whole system working together to support children and young people. Because Next Steps also focuses on non-CAMHS clinicians, it supported the redesign of how CAMHS is delivered in a broader sense. We work within a multi-agency environment and if we are saying to our colleagues in school or in Youth Offending, that they also need to be having these discussions with young people then we wanted to be able to help facilitate that. The Next Step cards can act as a bridge between the adult and the child and as bridge between CAMHS and community services; and the rest of the children’s workforce. The Next Step cards are intended to be accessible to those staff that work directly with young people but aren’t trained therapists. We knew that a lot of staff working with young people are often very hesitant to discuss mental health with them. In Wirral the cards form part of our model and we’ve actually increased our primary health care team. At that level, the Next Steps cards can be used to have those initial goal setting conversations with young people and then supporting whatever comes out of the conversations. It also means that with helpful facilitation through the use of the cards, the conversations are more likely to happen and be holistic and solution focused. How have Next Step cards changed things for staff and service users? There has been an almost universally positive response from staff so far. 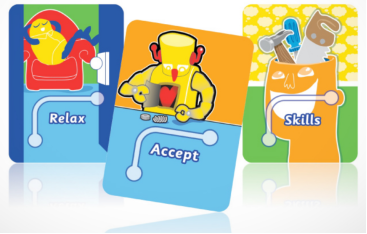 Staff like using the cards, and not just with young people but families have also been using them in family therapy sessions. Schools that have been trained in using the cards have told us that being able to use them and initiate conversations has actually prevented referrals to CAMHS. Practitioners such as school nurses and other non-CAMHS staff have reported that it has reduced their anxiety about having these kinds of conversations. It also means that young people are getting to have these conversations because the conversations are solutions focused and empowering as opposed to focusing solely on the problem. It definitely gives the young person a sense of agency! Our partner commissioners in Wirral and West Cheshire got right on board and took a leap of faith in a very helpful way. We haven’t got our Randomised Controlled Trial yet but they still supported the innovation and could see the difference Next Steps was making. The theory is we’ll see changes in the budget later down the line. Ideally, we want to ensure that young people with mild to moderate needs in the community are getting help, as demand for specialist services is increasing. Hopefully, more young people will be helped in the ‘Getting Advice’ or ‘Getting Help’ needs groups, rather than us simply benefitting from reduced demand. Some of the young people will be picked up earlier and supported. So, I don’t suppose we will see the impact immediately. Next Steps has also tried to work within the whole changing system of CAMHS service delivery. How will the Next Step cards be evaluated? At the time of writing, the evaluation is due to start soon and is integral to Next Steps. We want to get the resource out and tested. Obviously if we are charging for Next Steps it requires a proper evaluation – we only want to be pushing a resource that has an evidence base. We have plans to work with the University of Chester and the Dartmouth Institute in America, to conduct a proper evaluation on the difference Next Steps makes. Thank you to Emma Gilbert for help with writing this case study.